We are a first grade class from a small school in North Alabama. 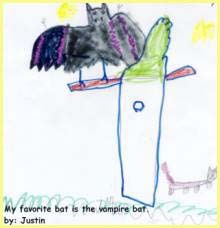 In October, we read the book Stellaluna and began a study of bats. 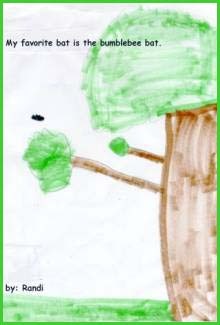 We used the Stellaluna CD Rom on our classroom computer, read many other books about bats, looked in the encyclopedia for bat facts, wrote poems about bats, and drew bats. We ended the unit by having a bat party with cookies and "bat punch." Each student had a surprise in their punch. There were flies in the ice cubes! (Plastic ones!) Stellaluna might not have liked them, but some of our bat friends would have. Below are some interesting facts we discovered about bats. Some insect eating bats can catch as many as 3,000 insects in a single night. Sometimes millions of bats live together in a cave. When roosting, their bodies are packed together like sardines. A few bats are meat eaters. They dine on fish, frogs, mice, and birds. Fishing bats use echolocation to find their meals. They send out signals to detect small ripples where fish are feeding. For the first few weeks of their lives, baby bats live on their mother's milk. In China, people are not afraid of bats. They think that seeing a bat is good luck. Bats help get rid of insects that bite people. When they eat grasshoppers, moths, and beetles, this helps the farmers. Unlike bird wings which are made of feathers bats' wings are made of skin! The largest bat in the world weighs about 2 pounds and has a wing span of 6 feet. There are about 1,000 different kinds of bats in the world. The largest is the Samoan Flying Fox. 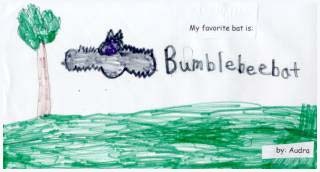 The smallest is the Bumblebee Bat. 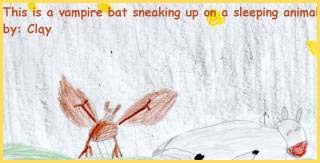 Vampire bats feed on sleeping animals usually cows or horses. A nd bats eat fish. T hey also eat insects. A nd they eat fish. T hey also drink animal blood. S o they are really harmless. A nd they are good. S o be nice to bats! S o they are not mean. A nd some are brown. T here are some that are grey. A nd some eat fish. by Laura B ats are good. A nd they are not mean. T hey fly in the night. S ome are different colors.